The Normandy city of Le Havre is a surprisingly exciting destination, and well worth a short stay. The second largest port in France, it stands at the mouth of the Seine estuary. While there are some old buildings and a stunning museum with the second most important collection of Impressionist paintings in France after the Musée d’Orsay in Paris, this is above all the city for fans of contemporary architecture. Le Havre (‘the harbor’) was created in 1517 by King François I. Intended as both a commercial and military port, it became the heart of the colonial and international trade of coffee, cotton, and wood. In the mid 19th century the first ocean liners left for the New World with Le Havre a major starting point, helped by the railway line constructed between Paris Gare Saint-Lazare and the port. Le Havre was also an important city for the Impressionists who viewed the light on the estuary where the Seine empties into the ocean as one of their great inspirations. As the major port of northern France, Le Havre was bombed almost out of existence in September 1944. The city was rebuilt between 1946 and 1964 from the plans of one single architect, Auguste Perret, though he didn’t live to see all the buildings he had designed. 100 international architects worked on the project after the war. Around 150 concrete residential blocks were built in the city’s destroyed docks to rehouse the city’s homeless. With a few old buildings still standing, new public buildings were constructed and they make a formidable collection along with some later buildings by Oscar Niemeyer and Le Volcan (The Volcano) theatre and library. 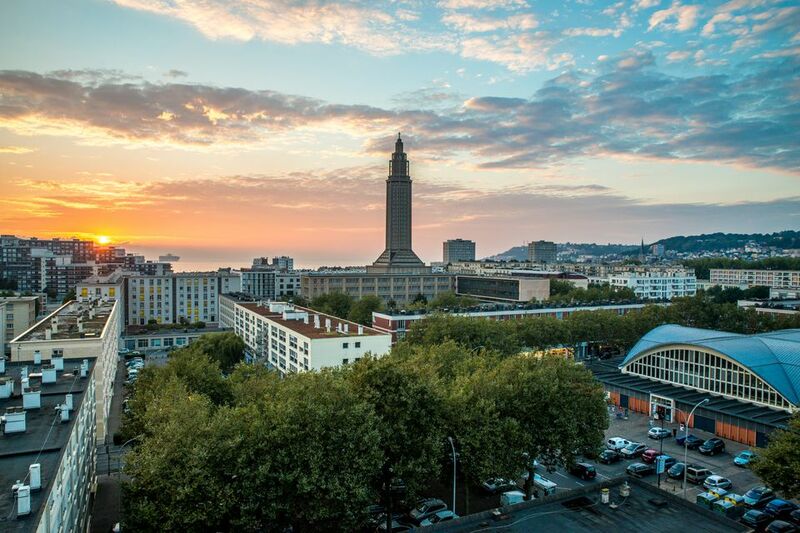 In 2005 Le Havre became a UNESCO World Heritage Site, recognized as an extraordinary urban complex. Brittany Ferries and DFDS Seaways operate frequent sailings from Portsmouth. The SNCF station is 10 minutes by foot from the center and near the ferry port. There are frequent trains to Paris and Rouen as well as other destinations. Die-hard architectural fans should book a walk with the Tourist Office for an expert view. But if you have limited time, or want both old and new, here's what to see. The Hôtel de Ville (Town Hall) stands where the rebuilt town and the old town meet and was the pivotal point for Auguste Perret's reconstruction. The town hall itself is a long low building with a 17-story concrete tower standing in front of an attractive large square with pergola walkways, fountains and flower beds. The whole sums up the architect’s desire that we should be surrounded by peace, air, sun, and space. St-Joseph Church was the last major design by Perret. From the outside it looks formidable: a building of speckled concrete with the 107m bell tower soaring to the sky, providing a beacon from land and sea. It would be at home in New York. Inside the altar stands at the center with the tower rising above, supported by pillars and columns. All is lit with 12,768 panes of colored glass that vary on each of the four sides: to the east and north the colors are cool while golden shades and bright color fill the west and south windows. The church, dedicated to the memory of those who died in the bombings, was intended as a symbol for the rebuilding of Europe and is now regarded as one of the 20th century’s great architectural achievements. Take time to look at the Perret Show Flat on the south side of the Place. It shows you what modernity looked like in the 1940s. Standing overlooking the harbor entrance and very near where Monet painted the city, the Museum of Modern Art is flooded with natural light, making it the perfect setting for the 19th and 20th-century paintings the museum is famous for. Stroll past the Impressionist works of Courbet, Monet, Pissarro, Sisley and more, plus over 200 canvases by Eugène Boudin. Later artists include the likes of Dufy, Van Dongen and Derain. Along the quays of the Bassin de la Manche, just opposite the port, the Maison de L’Armateur is one of the few historic buildings that survived the bombing. Built in 1790 by the architect in charge of building the fortifications of the city, Paul-Michel Thibault (1735-1799), it was then bought by a wealthy shipowner. You step into the past as you walk through the rooms. There are a reading room and a library, an 18th-century cabinet of curiosities which every gentleman had to show off the treasures acquired through the years, old model ships and more, perfectly illustrating the history of Le Havre. The center of the city was built on a grid pattern so it’s easy to navigate your way around the streets. Pick up maps and information from the Tourist Office then stroll through the Quartier Saint François, one of the oldest parts of Le Havre where the past sits comfortably beside the reconstruction. The lively fish market is open every day from 9 a.m. to 7:30 p.m. There's more to see along the Avenue Foch which runs from the Place de l'Hôtel de Ville to the ocean where residential buildings are the same height and concept but have different colors, windows, pillars, and shutters. It all makes for a remarkably lively and sympathetic style. Your best bet is the Vauban Docks, built in the late 19th and early 20th century originally to store the precious cargoes of coffee and cotton. These huge industrial buildings now house shops, cafés, and restaurants. The Best Western Art Hotel faces the Volcano cultural center, one of the iconic buildings by the Brazilian architect Oscar Niemeyer. With stylish rooms and public areas and dramatic photographic artwork on the walls, this is a good bet. Some rooms have balconies with great views over the harbor. Hôtel Oscar is a great place for the slightly eccentric. Its quirky 1950s style and minimal décor will suit some; its good value prices will suit everyone. Hotel Vent D’Ouest is a delightful hotel just near the sea. Stylish and comfortable nautical-themed rooms are a good size; there are 3 long-stay apartments and a spa using French NUXE toiletries. La Taverne Paillette is a great Bavarian brasserie with all the classics on offer, specializing in seafood dishes and choucroute, plus good beer selection. It’s open noon to midnight. 22 rue Georges Braque, 00 33 (0)2 35 41 31 50. Café Restaurant Des Grands Bassins is another Le Havre institution, near the Docks Vauban shopping center. Great décor, traditional Normandy cooking as well as seafood dishes and good service. 23 Bvd Amiral Mouchez, 00 33 (0)2 35 55 55 10.